Lula Bungalow is a special bungalow in Banana Beach. Referred to as our honeymoon bungalow, Lula's King-Sized canopy bed makes it a perfect option for vacationing couples and newlyweds. Located close to the pool, and just steps from the ocean and Banana Beach Restaurant. The additional sofa-bed makes Lula Bungalow an option for couple with a child (or a third adult) as well. Lula Bungalow offers air conditioning, a king-sized canopy bed and sofa bed for a maximum of 3 people, wifi, desk area, closet space, cable television, private bathroom with hot water, an equipped kitchenette, refrigerator and coffee maker, a safe, and spacious terrace with a hammock and chair, and table. Bath and Pool towels are provided. Banana Beach Bungalows offers several types of bungalows. Amongst our bungalows in Banana Beach, we offer three identical bungalows. Each airconditioned bungalow has a queen-sized bed and a king-sized bed, with a maximum capacity of four people. Amenities include Wifi, cable television, safe, desk area, closet space, private bathroom with hot water, an equipped outdoor kitchenette, mini-refrigerator and coffee maker. Enjoy the spacious outdoor terrace with a hammock and chairs. Bath and Pool towels are provided. 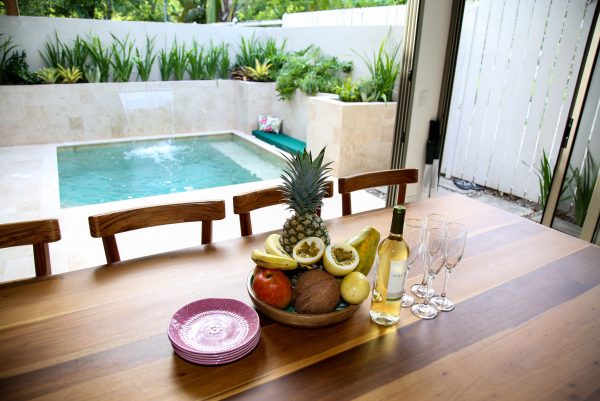 With two queen-sized beds, Reef Bungalow is a great option for two to four people. The bungalow has a spacious terrace with hammock, chair and table, outdoor equipped kitchenette and garden. Amenities include airconditioning, wifi, a safe, cable television, desk area, closet space, private bathroom with hot water, mini-refrigerator and coffee maker. Bath and Pool towels are provided. A step up from our regular bungalows, Coral Casita is one of our two casitas. Unlike our regular bungalows, this larger bungalow has a private bedroom with a queen-sized bed. The main room has a king-sized bed and sofa bed, and can accommodate five to 6 people. This is a perfect option for families or larger groups of friends. Coral Casita offers air conditioning, wifi, a safe, cable television, desk area, closet space, private bathroom with hot water. Bath and Pool towels are provided. Outdoor amenities include an equipped outdoor kitchenette with mini-fridge and coffee maker. A spacious terrace with a table, chairs, and hammocks. A step up from our regular bungalows, Casita Linda is the largest of our two casitas. Unlike our regular bungalows, this larger bungalow has a private bedroom with a king-sized bed and sofa bed. The main room has two queen-sized beds. 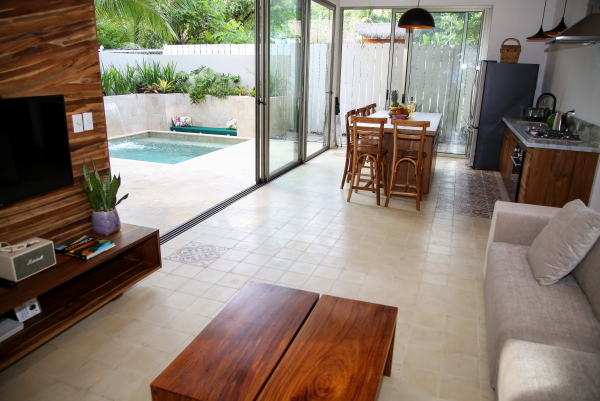 In total, Casita Linda can accommodate up to 7 people. With 4 beds, this is a perfect option for families or larger groups of friends. Outdoor amenities include an equipped outdoor kitchenette with mini-fridge and coffee maker. A spacious terrace and garden with a table, chairs, and hammocks. While not a part of Banana Beach Bungalows, we can't help but let you know about Villa Bonita. Located only a short walk from Banana Beach Bungalows, Villa Bonita has 4 bedrooms (2 with king-sized beds, 1 with a queen-sized bed, and one with a double bed) and can accommodate up to 8 people. A large terrace, private pool, BBQ area, gazebo and large yard, and only steps from the beach. Amenities include Air conditioning, Dedicated Wifi, Fully equipped kitchen, daily maid service, night watchman, and more. Casa Keshet is a fully furnished modern house on a beautiful beach property with 2 master bedrooms, a living room& a spacious terrace with a private pool. Each bedroom has a king sized bed, TV and en-suite bathroom. The kitchen is equipped with a full oven and stove top, a coffee maker, blender & toaster. We put a lot of thought in to every detail, this house is your home away from home! The house has 2 king-sized beds, for 4 people. We bring in a extra mattress for the 5th person.